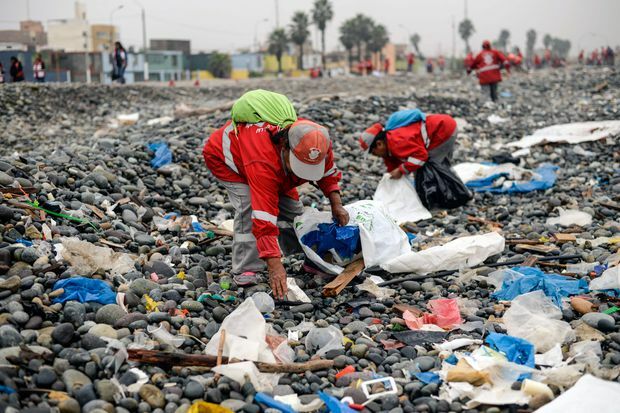 Volunteers clean up plastic waste on a beach in Lima during the World Environment Day last week. The United States and Japan declined to sign onto an agreement between the other G7 countries to reduce the amount of plastic waste in the world’s oceans and cut down on the usage of single-use plastics, such as straws, bottles and cups. Canada, France, Germany, Italy, Britain and the European Union endorsed a G7 ocean plastics charter, Prime Minister Justin Trudeau announced at the leaders’ summit in the waterfront town of La Malbaie, Que. The pact calls for signatory countries to reduce the use of plastics and, where alternatives are not available, find ways to include more recycled materials in the plastics they do use. “This is good news not only for the environment, but also for businesses, who can stand to benefit from reducing the costs associated to plastic use,” Mr. Trudeau told reporters Saturday. Mr. Trudeau said Canada will also invest $100-million to rid oceans of global plastic pollution. According to the federal government, less than 10 per cent of all plastics are recycled worldwide. It also says there are more than 150 million tonnes of plastic waste in the oceans and, at this rate, plastics could outweigh fish in the oceans by 2050. The U.S. decision to refrain from signing onto the plastics charter did not come as a surprise, given its refusal to join the Paris climate agreement. Japan’s reasons were not as clear; a query to the Japanese embassy in Ottawa was not immediately answered Sunday. Environmental advocacy groups say the plastics charter does not go far enough on the policy and enforcement fronts. “This plastics charter is another non-binding, voluntary agreement that fails to secure the action needed to get to the root cause of the plastic pollution crisis,” said Farrah Khan, Greenpeace Canada plastics campaigner. The group called for a Canadian national plastics strategy, including a total ban on plastics that can’t be recycled. “The federal government must commit to domestic actions that address Canada’s embarrassingly low plastics recycling rate, currently at only 11 per cent. The rest end up in landfills, oceans, lakes and streets, or burned in incinerators,” said Ashley Wallis, program manager for Environmental Defence. Earlier this year, Environment Minister Catherine McKenna launched public consultations to develop a national plastics strategy. She has said the federal government has to work with provincial and territorial governments, as well as industry, to forge a plan. “We have the equivalent of one dump truck every minute of plastic waste being dumped into our oceans and we are very concerned,” Ms. McKenna said during the G7 Summit. The G7 meeting was overshadowed by the reaction of U.S. President Donald Trump, who tweeted after leaving Quebec that the United States would withdraw from the leaders’ communiqué over the ongoing tariff feud with Mr. Trudeau. The Prime Minister said the plastics agreement is an example of what the G7 can do when it works together. “It’s true that we didn’t actually resolve all the problems facing the planet this weekend in Charlevoix, but we made significant progress in terms of forging a consensus about certain major challenges,” Mr. Trudeau said in French Saturday.